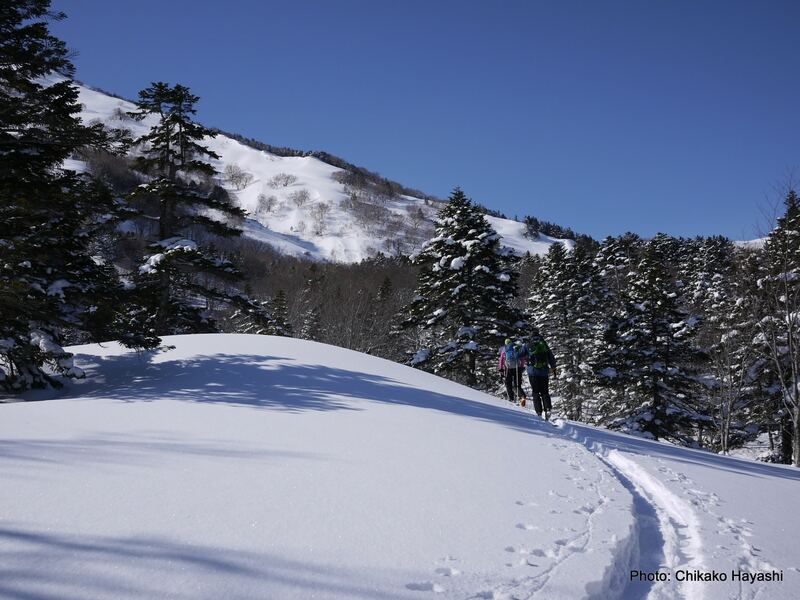 A 6-day ski touring adventure in the backcountry of Hakuba. 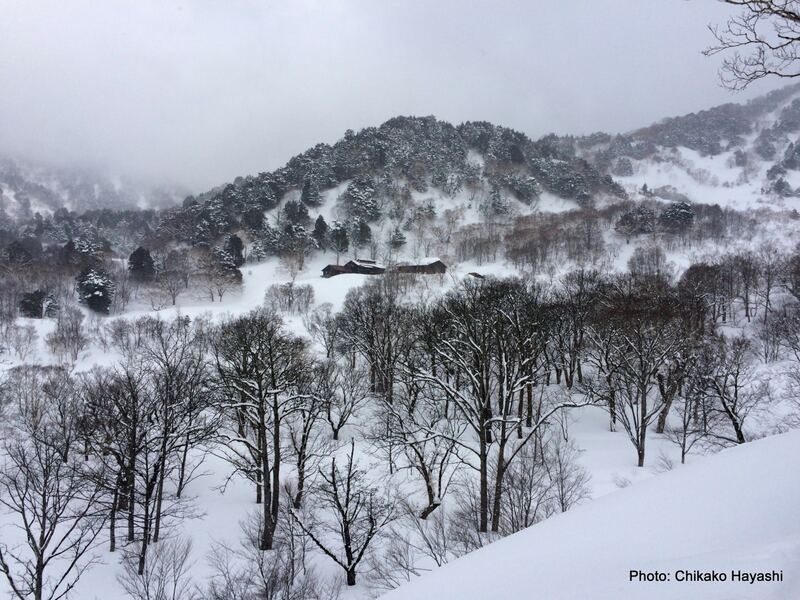 Enjoy deep alpine powder skiing and relax in some remote and wonderful outdoor Onsen (hot springs), together with Chikako, a local JMGA mountain guide. 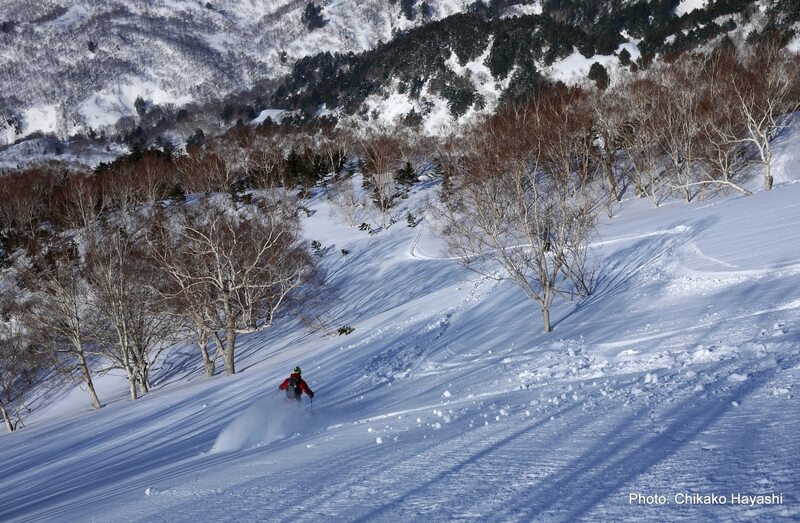 Ski the steep alpine terrain of the Hakuba backcountry in the Japan Alps and enjoy its famous hot springs afterwards! 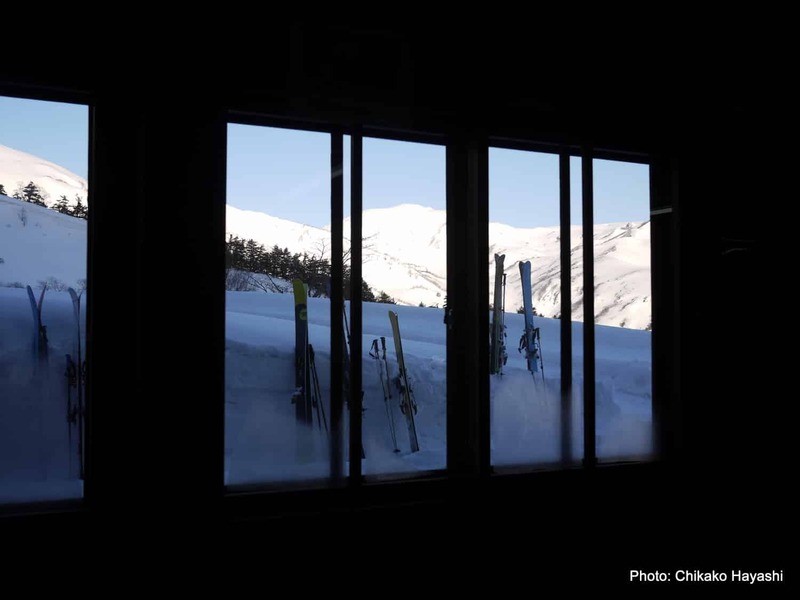 Most winter visitors dream of skiing in the distant off-piste deep powder snow. 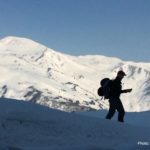 Now, these less visited areas are accessible with a certified local mountain guide! 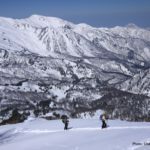 I will take you on a challenging 6-day ski tour in the alpine backcountry of the Hakuba Valley. 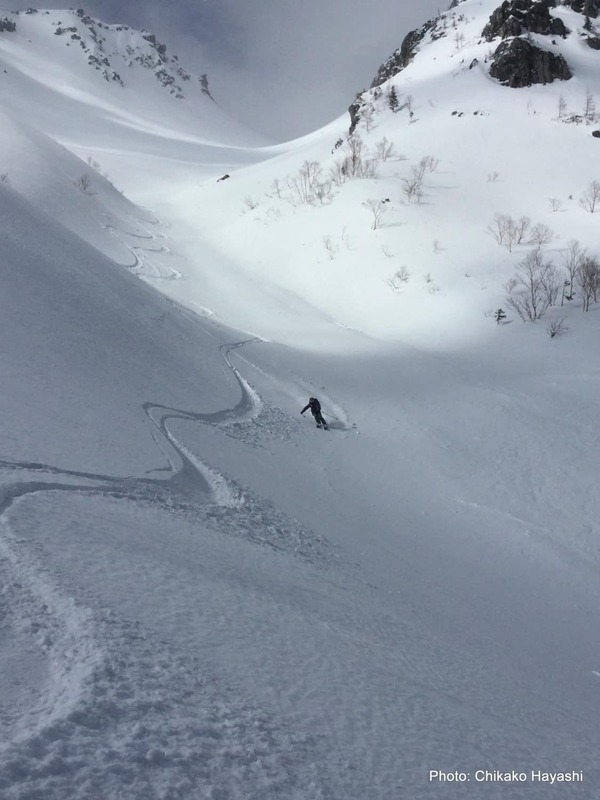 The snow in this area is very deep and popular among backcountry skiers in late winter or early spring. 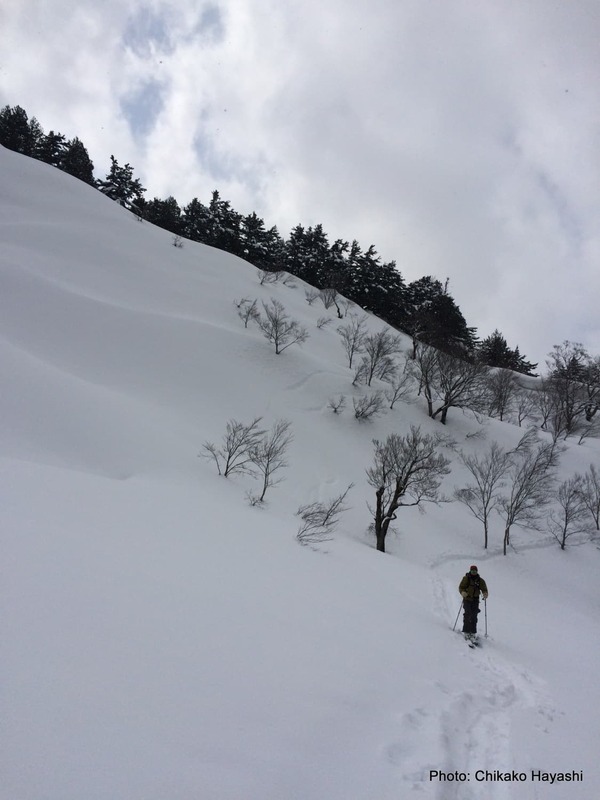 Please take into account that this program is only offered from mid-March to early May (as the Renge hut opens in mid-March). We’ll be staying at two different styles of Onsen accommodations. 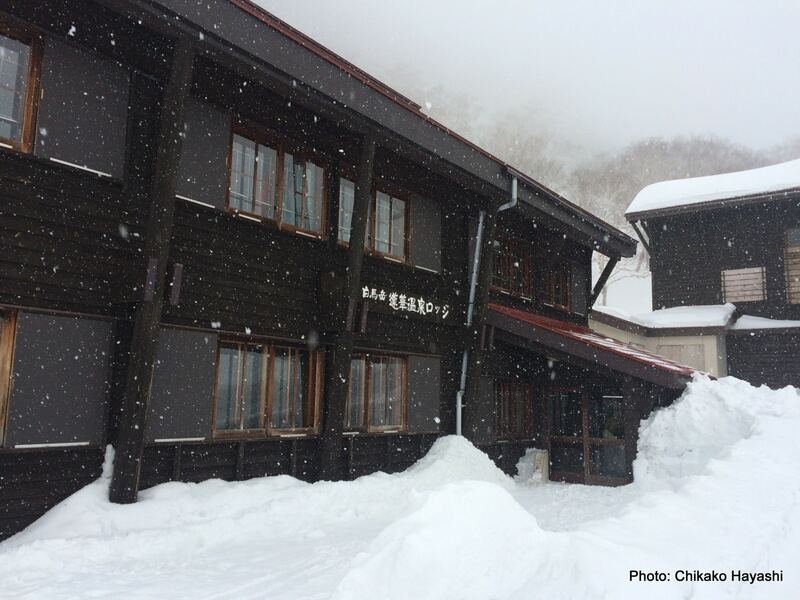 Renge Onsen, a mountain hut with an outdoor hot spring (‘onsen’) and Nakanoyu Onsen, a ryokan with onsen facilities. Rest and relax at the end of your skiing day in these wonderful outdoor hot springs! 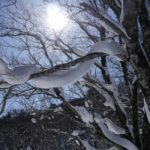 Renge Onsen is particularly special and unique as it is only open for 4-5 months in a year and only 1 month during winter. 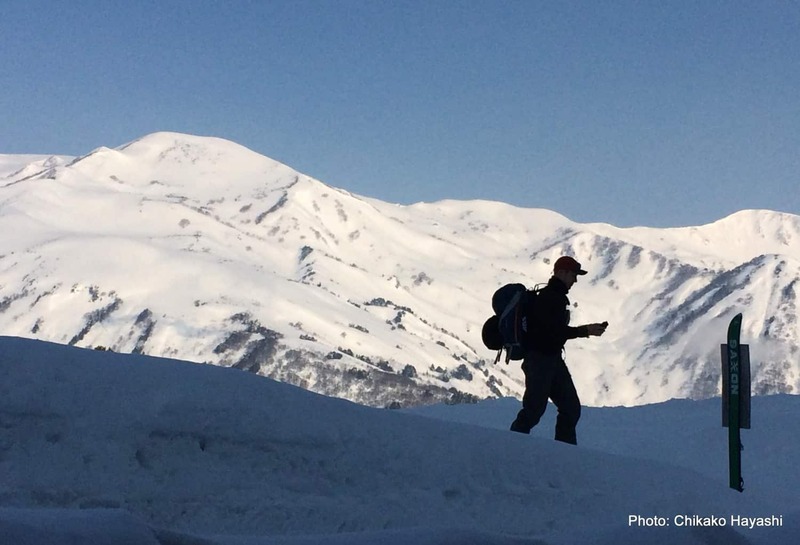 March and April are not high seasons so you can explore and enjoy this area on your own with few other skiers! You can also bathe outside whilst enjoying the views of the surrounding snow covered peaks. Besides, volcanic smoke is visible from the crater of Mt. Yake and it is amazing! After skiing Mt. Yake, on the way to Nakanoyu Onsen we will walk through a long and dark tunnel with our head lights on. At the end of the tunnel, we will be picked up by the hotel transport. This is the only way to reach this destination! 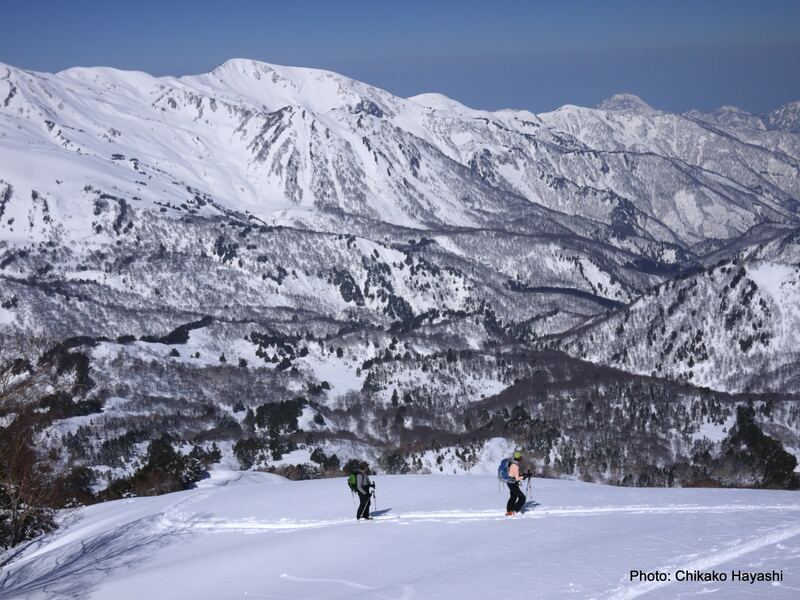 This trip is a great chance to explore the heart and the wildness of the Japanese Alps. Plus, you can relax and heal your body after skiing! 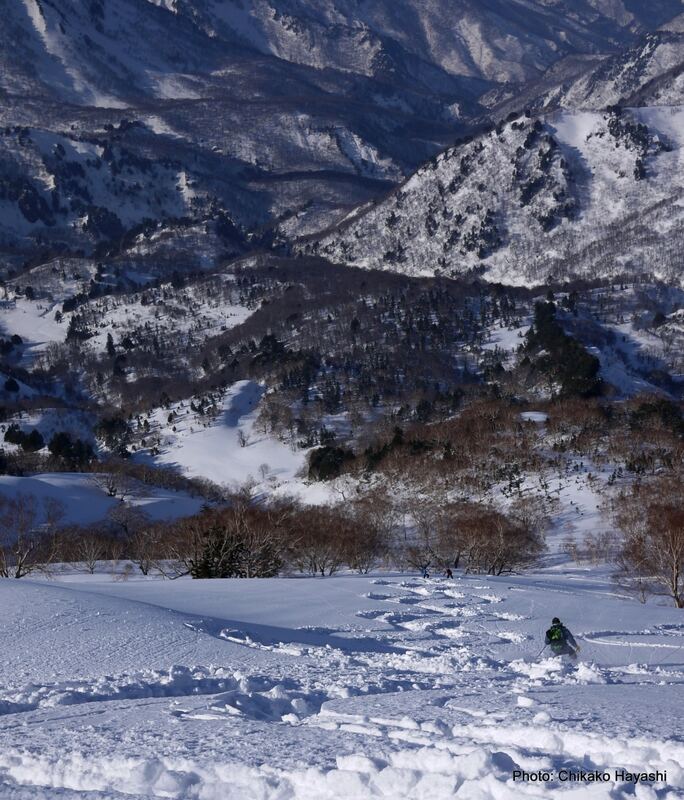 Would you like to join me on this amazing ski adventure in the remote Hakuba Valley? Please contact me, I’ll be happy to be your guide. 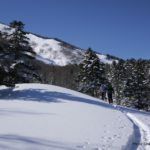 If you are planning to visit this area during summer or spring, you can take a look at this 3-day hiking traverse in Hakuba. 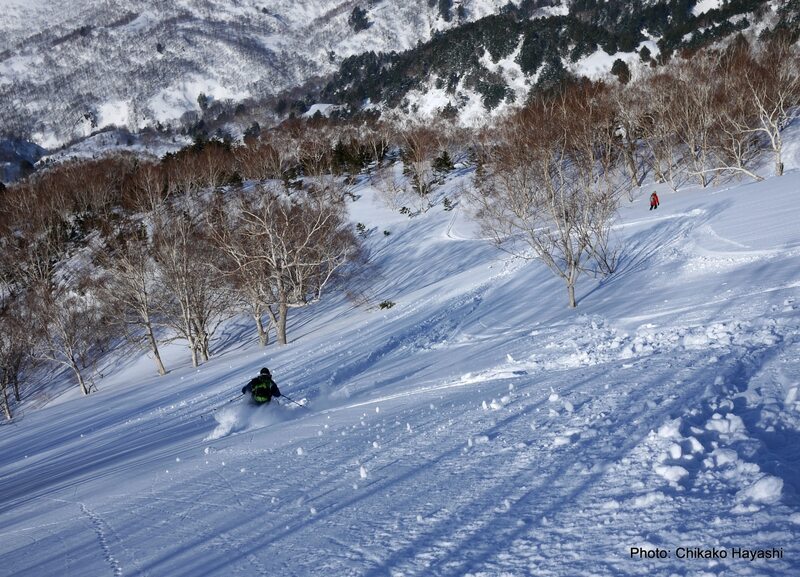 Meet at Hakuba at 8:00 am. 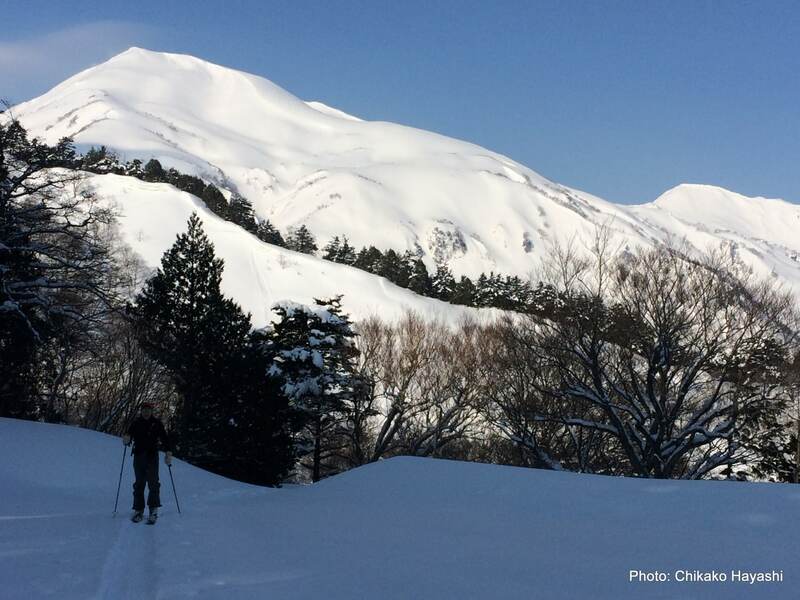 One day skiing day around Hakuba to warm up for your ski touring trip. 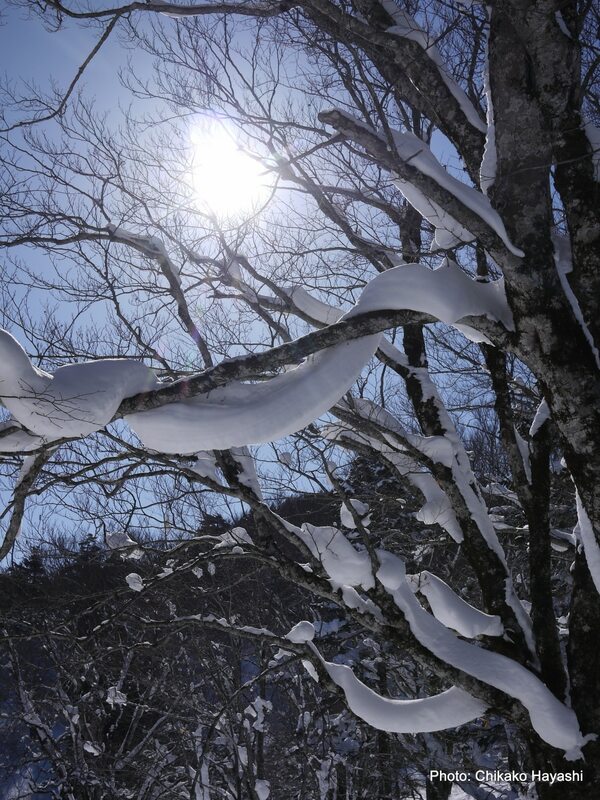 Nakanoyu Spa Inn - a Solitary inn surrounded by the virgin forest of Japanese beech trees. 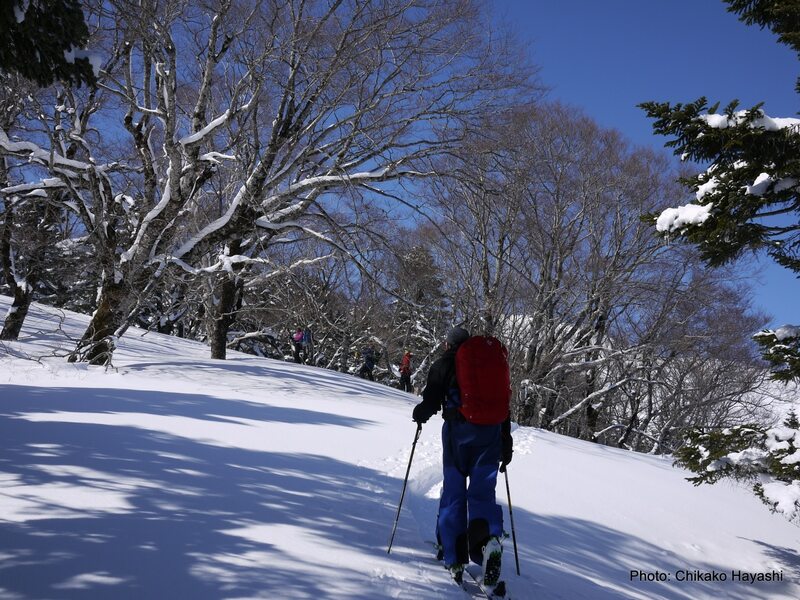 This one is in Kami Kochi area so you can explore and ski Mt. Yakedake area from here. not soon forget. The route was challenging, airy exhilirating and we wouldn’t change a thing. and did everything to make sure we are ok. Communication from the start was perfect and everything well organised. my daughter and I at the hotel at Yamanakako early in the morning and brought us to Mt Fuji. 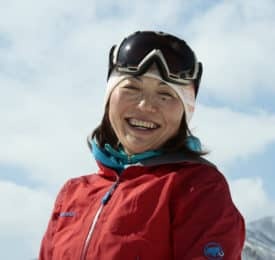 During the drive, Chika shared with us her background and expereince in climbing and guiding mountains and back country ski trips throughout the Japan and the world. We actually saw a bear along the side of the road at Mt Fuji during our drive to station 5. During the ascent, it was evident, Chika’s primary concerns were safety and a successful ascent. The climb was paced perfectly for our fitness level, and the hike around the crater at the top provided amazing views due to the perfect weather. Chika’s great personality, knowledge of the outdoors and Japanese history kept the conversation flowing and enriched the entire experience. Anyone visiting Japan with an adventurous spirit should climb Mt Fuji, and I highly recommend using Chika as your guide. Without reservation, she is the best! around my schedule and the weather as well. expert climber and from time to time I suffer of vertigo. Well, she managed everything perfectly, giving me many tips and letting me always feeling safe and secure. Also, the sunrise on the top of Mt. Fuji is breathtaking, you will never forget it. I am very grateful to Explore and Share and Chikako for this experience! The summit, bjt the views are Worth It. The Mountain huts are very cosy, clean and have All very friendly staff. The food is very food and the lunchboxes they provide are varied and more Than sufficient. You can even take a hot bath in the Mountain hut next To the summit. 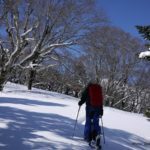 The onsen (hot spring) is a perfect way to end This Mountain trek.. Chikako is a very friendly and experienced Mountain guide, who is Always willing To help and her English is excellent. I definitly recommand This trip To other hikers, the help of a guide is advisable as locals do NOT speak English and maps are NOT available in English either. Chikako is the best guide One can imagine.